Many of the original settlers in the United States came from Ireland and Scotland. With their families and belongings, they also brought knowledge of distilling Whisk(e)y. As colonies on the east coast were starting to fill up and become more productive, politicians wanted settlers to move out further west. In 1774 Kentucky was considered part of Virginia and in 1985 would later be subdivided into colonies, hence “Bourbon” was a colony. In order to convince people to travel and explore new territories, some incentives were offered. Thomas Jefferson was the Governor of Virginia at this time and offered pioneers 60 acres of land in Kentucky if they would build a permanent structure to raise “native corn”. Many farmers grew a surplus of corn in areas with limestone rich water and Bourbon is what resulted from their experiments with it. Bourbon is first to have been invented by the Baptist Minister Elijiah Craig. He is also the first person to age it in charred oak casks. In 1783 Evan Williams became the first commercial distiller in Louisville, Kentucky. Around 1785 Bourbon County was created and would be referred to as “Old Bourbon”. Bourbon County was actually named after the French Royal Family “the Bourbons”, who helped support the county during the Revolutionary War. Later in 1789 the first distillery was founded in Fayette County. Congress caught on to this lightning fast growing spirit in 1790 (1791 was the official taxing year) and they started to tax Whisky production to surplus income. Farmers and smugglers alike could no longer take it and rebelled in 1794. The Writs Grants Land Act was passed in 1794 so farmers had to grow corn on their 60 acres of land, and as said above, the excess corn was used to make corn whisky. Initially extra Whisky and Bourbon was stored in barrels, but the barrels used stored fish before the spirits. A funky flavored spirit was coming out of the barrels, so distillers decided it was best to char the barrels. Charred barrels could be transported easier and as the Bourbon was stored, the wood added sweet flavor and richer colors. Around the early 1800’s there were approximately 2000 distillers in Kentucky making spirits. Dr. James Crow also developed the “Sour Mash” process where he would save a portion of the previous batches mash to stat a new batch. This ensured consistency of each new Bourbon batch. As the late 1800’s came around, Bourbon moved out West and people asked for “Bourbon County Whisky”. 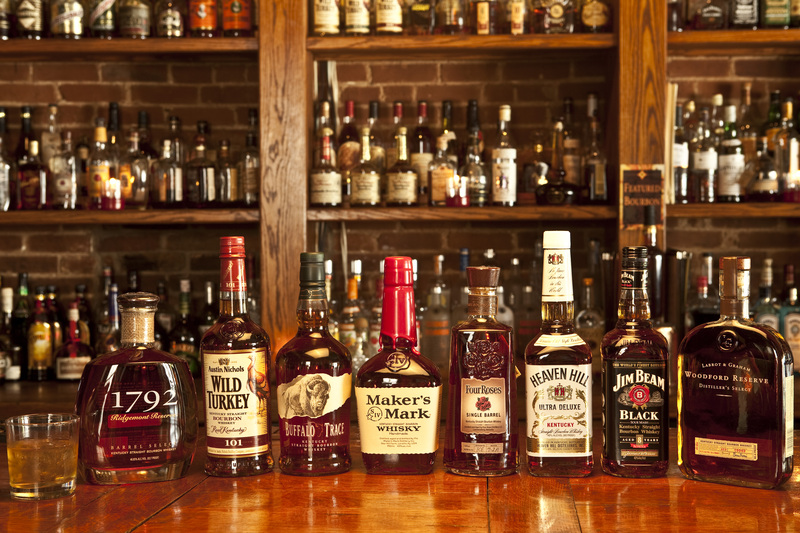 The large 3; Jim Beam, George Brown and Jack Daniels were born in 1846 and Bourbon and Whisky would never be the same. 1894 produced Bourbon in bottles and once again allowed more people access to the spirit to drink and travel with. From 1894-1897 the “Bottled in Bond Act” was passed by Edmond Taylor of Taylor Whisky. This means that the Bourbon must be 100 Proof and aged for 4 years in a bonded warehouse. During Prohibition which last from 1920-1933, many whiskey distilleries in America were shut down. Spirits from Canada and Europe were being smuggled in to the U.S.A. Only a few were able to stay open because some Bourbon’s were considered “medicinal” such as Old Forrester and Old Grand-Dad. President Roosevelt repealed Prohibition in 1933 and people started boozing it up again. In 1964 Bourbon was named America’s Native Spirit by a Resolution of Congress during Lyndon B. Johnson’s Presidential term. The 1990’s seemed to really revive Bourbon by the Small Batch Bourbon Trend. Hand crafted and almost custom made Bourbon’s were being produced, bottled, sold and enjoyed. Bourbon first begins with a mix of ground corn and limestone rich water mixed together and cooked at a high temperature. Once the temperature lowers, rye and/or wheat is added and is cooked some more. After this mixture has cooled, barley malt is added to help convery starches to sugar and this makes the mash ready for fermentation. The mash bill of a bourbon is usually made up of corn, wheat, rye or malted barley. Wheated bourbon will contain large amounts of whiskey and corn whiskey contains 80% corn in the mash. Yeast is added to the mash and fermentation will begin. Yeast converts sugars to alcohol and also releases CO2. This is now called the “Beer”. Bourbon uses a “sour mash” from a previous distillation to ensure consistency, but some companies use a “sweet mash” like Woodford Reserve’s Masters Collection. The man credited to have invented the sour mash process is James C. Crow at the Old Oscar Pepper Distillery which is now the Woodford Reserve Distillery in 1823. The sour mash introduces acids into the mash to control bacteria growth. A sweet mash uses fresh water to begin the fermentation of the mash. The fermented mash is called a “wash” or “distiller’s beer” and then it is distilled between 65-80% alcohol. The distillation process is either done in pot stills or continuous (Coffey, Column) stills. Bourbon is double distilled. The first distillation is called “low wine” because it’s lower proof. The second distillation is called “high wine” or “white dog”.The resulting spirit from this process comes out clear and it is then added to the newly charred oak barrels to obtain its darker rich color. Barrels are the moved to rackhouses where they will be stored for various years. Settlers first stored excess surplus Bourbon in oak barrels. These barrels were actually used to store fish and vinegar which added a not so pleasant flavor to the spirit. The longer the aging in the barrel, the more color and flavor the Bourbon will have. Bourbon tends to be sweeter in taste from the wood sugars. When the barrels are charred, the wood sugars are brought to the surface and as the spirit ages, it absorbs the sugar. Bourbon is typically aged for flavor and not for its age. A good example of this is Maker’s Mark Bourbon Whiskey. After the aging, Bourbon is usually diluted with water to around 80 proof. A whiskey that is not diluted down is usually referred to as “barrel proof”. Anything that is less than 80 proof is “diluted bourbon”. Straight Bourbon – Aged a minimum of 2 years, no added color, flavor or neutral spirits added to it. If it is aged less than 4 years, it must be labeled with its age. Blended Bourbon – Blended Bourbon has neutral spirits added to it. It can contain additional flavors or colors. 51% of the blend must still be straight whiskey. The age reflects the youngest whiskey in the bottle. Small Batch Bourbon – Bourbon that is made from special selected barrels and blended together. A.H. Hirsch makes some fine Small batch Bourbon. Corn Whiskey – 80% of the mash contains corn. Single Barrel Bourbon – A batch of Bourbon from a specifically chosen cask. Bourbon varies in flavor, color and body due to many factors. Aging, barrels and the mash all play particular roles. Bourbon can have nutty aromas, praline, almond, vanilla and sweet dried fruits. The barrels can also add a spicy and smoke flavor. Love your picture of Bourbon, and I’d like to use it on my blog “Southern Belle, Northern Life.” Do you mind?